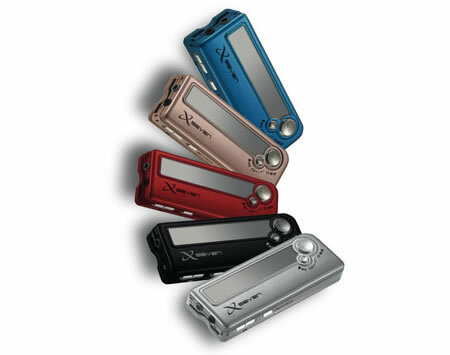 Sea Grand “XS-701 X-SEVEN” MP3 players provide high-quality digital music playback with sophisticated navigation and expandable memory at an affordable price. 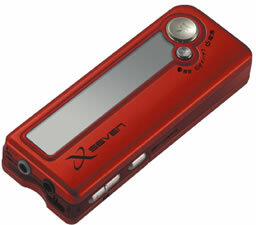 The portable audio player with SD card slot is available in 1/2GB memory capacity. The Small, lightweight MP3 Player with built in speaker and FM tuner is available in five pleasing colors. The SD expansion slot lets you add up to 512MB of additional memory. The player plays MP3 (8 – 320kbps), WMA (32 – 192kbps), audible audio file formats. The player can be used as a voice recorder with the built in microphone and also can record radio programmes.Direct sound recording to the SD card is not possible. With Hi-Speed USB 2.0 port for fast and easy transfer of files, the player can be used as an external storage device for data store and transfer. With Up to 11 hours continuous playback using one AAA battery, Sea Grand “XS-701 X-SEVEN” MP3 player measures 33×86×17mm and weighs approximately 40g.The Sea Grand XS701-1GB model will be available for approximately 14,800 Yen ($127) and XS701-2GB model for 19,800 Yen ($170) from September 7th.